After many letters from our customers that they were using one of our outdoor knives as a steak knife, this set was designed after the Trout and Bird belt knife. The blade is serrated only at the tip where most cutting takes place. A one-of-a-kind very original, comfortable design of steak knife. 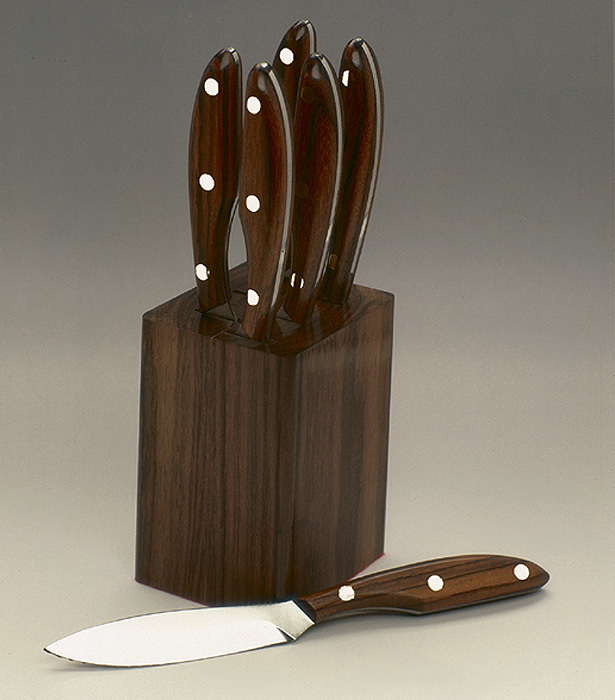 This set includes (6) #R22SF rosewood handle steak knives with flat grind blade, partially serrated tip, full tang steel. Comes in a solid rosewood block (#60RH). You can also order the knives individually if you just need to replace one etc or if you are chosing a different steak block from the block page.